The three large fields of research migration, citizenship and development have all witnessed considerable change in normative evaluation and academic interest over the last few decades, as have the interlinkages between these fields and their mutual dependency. Developments in these fields include the global change in perception, which has given migratory phenomena positive connotations, rather than a sole focus on its negative aspects, the growing interest to understand how migrant populations can positively affect social and economic development in their countries of origin and a better understanding of migrants’ transnational practices and their simultaneous involvement in and attachment to more than one polity. Migration, Citizenship, and Development addresses these issues and their complex interlinkages. 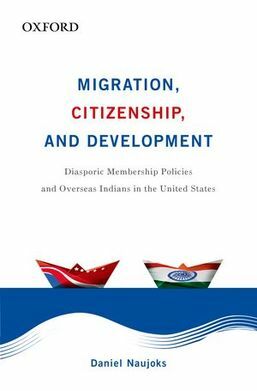 It explores how legal forms of membership shape individual and group behavior, ethnic and diasporic identification, economic and political behavior. Thus, it opens the 'black box' about how country of origin citizenship affects activities that are relevant for the development of the country of origin (see graph below). Migration, Citizenship, and Development will be of considerable interest to scholars and students of migration and development, political economy, sociology of law, immigrant integration, South Asian studies, transnational studies, and citizenship studies. The work also engages policymakers and journalists by throwing light on the complex interplay between individual and collective actions and the role of state policies and law.